Fonterra says Chief Executive Theo Spierings, who was paid about $8.3 million by the co-operative last year, will leave later this year. The announcement came as the co-operative announced a loss for the first half of the year. Fonterra chairman John Wilson introduced Spierings' leaving as "one final matter" at the end of a briefing at Fonterra's HQ in Auckland on Wednesday. He said the board had taken the decision to bring forward the announcement, which it had previously expected to announce in April "or so". The board and Spierings had commenced "formal succession discussions" last year, he said. "As a result of that, the board initiated international searches in November to identify potential candidates. "Theo and the board have now agreed that Theo will leave us later on this year." The board was now short-listing for a replacement. It wasn't clear when an announcement would be made, but in the meantime Spierings would continue on, Wilson said. He said that after the new CEO was appointed, Spierings would continue to provide advisory work for the co-operative during the transition period. Wilson said that after Wednesday neither he nor Spierings would be making further comment on the issue. Asked to make some comments, Spierings said: "These are always awkward moments; they don't happen too often in your life. "When we are talking about a big company like we are it is very normal that we look at strategy and we look at proper succession and leadership. And we had very constructive discussions." He said he had been approaching seven years in the CEO role at Fonterra. "It has been quite a ride with a couple of unexpected events here and there but when I came in I said I see Fonterra as really the envy of the dairy world - and that is what it actually is." Fonterra is "are a very strong co-operative, very well placed, and we are driving that innovative co-op". Spierings said there were a whole lot of things happening for the future - and that took a requirement of a commitment to leadership for the next five to seven years. "And that's a big commitment that a leader needs to drive forward because this co-operative will be the best on the planet. "So, it is normal succession planning. "Yes, it's maybe a bit earlier and a bit awkward as well of course for myself but we are going very hard over the remainder of the year. We are very confident and I look forward to solving some of the challenges which we still have, especially in China. "And I'm not focused on what's next, but my slogan for what's next is that I would like to focus on a better world rather than a bigger job. So, that's one quote, if you like. And joining Fonterra you know that it is extremely close to my heart and it always will be." 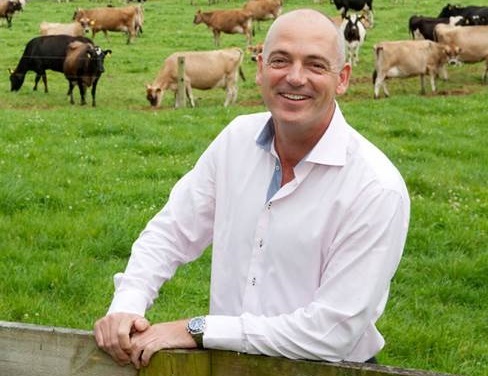 Fonterra Co-operative Group Limited (Fonterra) today announced that, as part of a planned CEO succession process, the Fonterra Board and its CEO Theo Spierings have agreed that Mr Spierings will leave his role later this year. Fonterra says its Board and Mr Spierings had formally commenced succession discussions last year. As a result of that, the Fonterra Board initiated international searches in November last year to identify potential candidates and was now short-listing candidates. Fonterra Chairman John Wilson says the Board was taking the decision to bring forward the announcement, which the Board was expecting to make in April, to avoid speculation. “It is not yet clear exactly when any appointment for Theo’s replacement will be made, but it is absolutely clear that Theo will continue in the meantime to drive the Co-operative’s strategy and business, with special emphasis on China. “The Board and Theo are committed to a high-quality transition to a new CEO and when we have more information in regards to timing we will let our farmers and the wider market know. Until then it is business as usual with the focus on driving returns to our farmers and unitholders. “We envisage that even after the announcement of our new CEO, Theo will be involved in an advisory role so that we make best use of his knowledge and expertise during the transition,” says Mr Wilson. Mr Spierings says that he has been proud to have led Fonterra as CEO for seven years as the Co-operative has established a strong demand-led strategy and oriented itself to become innovative and sustainable. “It is now time for a new CEO who can lead the Co-operative through this next phase. The time is right for the Co-operative and that is important to me and to the Board. Theo disproves the theory that if you pay millions you get a good CEO. If they advertised the new job at $200K, they are just as likely to get a good CEO as if they offered $5mil. “It is also the right time for me personally. I look forward to creating new challenges"
Democracy is such a good thing in NZ because no one is accountable and you can just walk away with millions in pocket even if you make billions of losses. This applies to both government and business. To look after NZ's interests, holding (ONLY) a NZ passport needs to be a prerequisite condition to take key positions in NZ!! Fletchers, Fonterra, next cab please. Mainzeal, Solid Energy.... ??? Genesis Energy? The makeup of the Board has quite a different skillset now, to what it used to be when directors usually got elected because of the shareholder council pathway or they were well known farmers from the Waikato. Time will tell if this means the Board is better able to hold management to account. Will be interesting to see if Nicola Shadbolt makes it through to be nominated for the Board this year. Imo John Wilson would prefer her not to be there. I would like to know what is going to happen to the the Fonterra Board Members that were on the Beingmate board. I would say that they have even more difficult questions to answer. I agree re Nicola Shadbolt CO. Would like to add the performance of Fonterra is as much to do with ineffective cronistic board engendering culture of excess, rather than the individual CEO they employ. Excluding Greg Gent, governance has been disappointing since formation, and engineered to undermine cooperative principles. I can safely say I've never lost $405m. Nor have I lost that much of someone else's money either. What a sack he has left for the next CEO. There is still likely to be another few hundred million written down on Beingmate to come. Just need to give John Wilson the same treatment. Jenny Shipley,Brownlee, Mark Hotchin, Watson? Surprised he lasted as long as he did.